Mad Science wants to provide you with an event to remember! 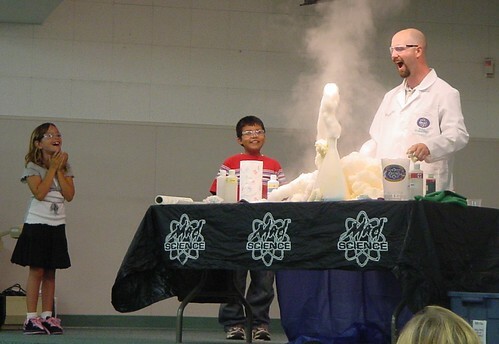 Mad Science shows are designed to amaze and entertain young audiences of any size in a unique way. All shows are high energy, exciting performances that show kids just how much fun science can be. Highly interactive – Volunteers are used throughout each show and audience participation is encouraged. Action packed – 45 minutes of fascinating science demonstrations such as chemical reactions, bubbling potions and even an air-pressure powered hovercraft! Grade appropriate – Each presentation is tailored to the specific age range. 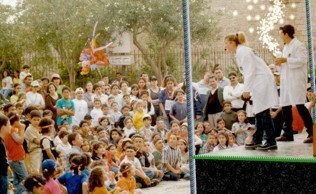 Flexible: Shows can accommodate up to 300 kids per show. We can conduct multiple repetitions on the same day. Hassle-Free – We come to your location and bring all the equipment and materials. Mad Science Shows are perfect for any event! We have six shows to choose from. Click HERE for for descriptions.